At the end of the second week we bid goodbye to Kahini, Shivang and all their friends and crossed the Mara River to go towards Talek River. This week we had a group of close friends and family who were booked in Sunworld Safari’s amazing camp (Mara Bush Camp). This place is located in the best photography location inside Mara. You are literally living in “Cat Central.” This area is particularly great for Leopards, Caracals and Servals – all three are Mara’s least seen cats. The river is a short drive away so it works very well. In the early mornings and late evening you look for cats and when the sun is high you head to the river to try to catch a river crossing. 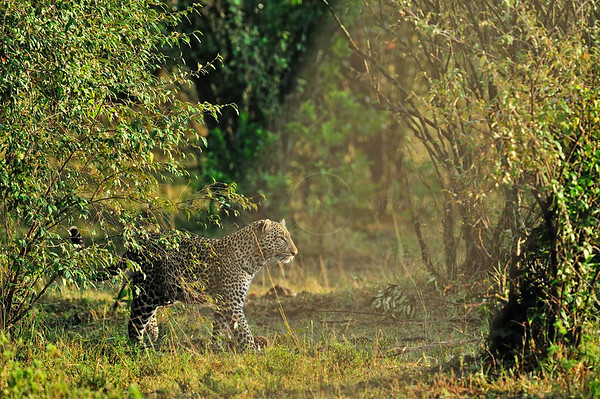 We started the week with a brilliant sighting of a leopard family and mating lions in great light. 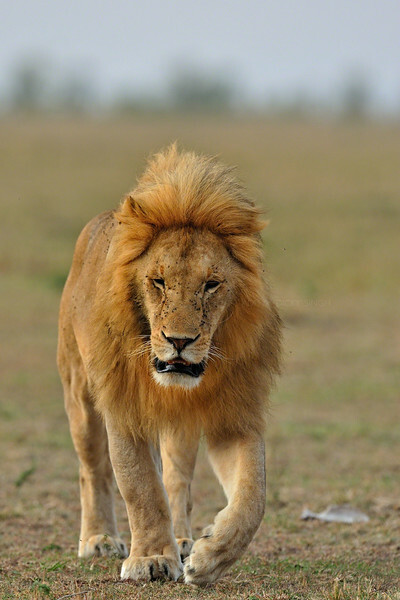 By the time the week ended we had seen seven different prides of lions and some solitary males including the one below, nine different cheetahs, six different leopards, a family of three caracals, lots of cat action and only one river crossing (a stunning one). Another good week in Mara but then Mara never lets your cameras down. 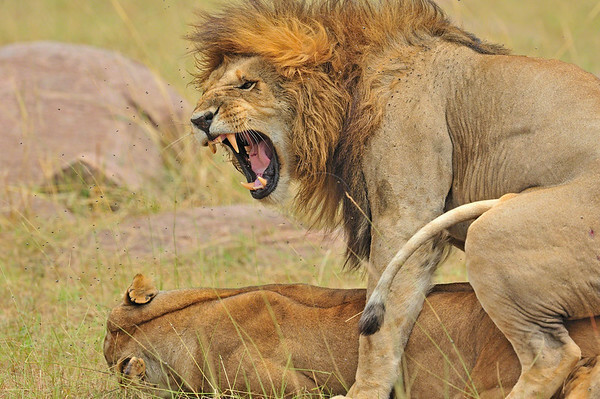 Photographically speaking Masai Mara makes it too easy. In no other place can you collect so many good pictures so fast. 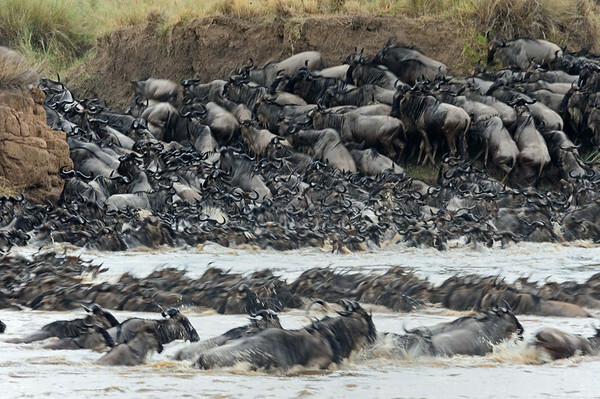 We saw a massive build up of wildebeests in the Paradise plains for three days in a row though they never crossed. We could see large buildups across the Mara River on the Mara Triangle side too. However there were no river crossing till the fifth day. 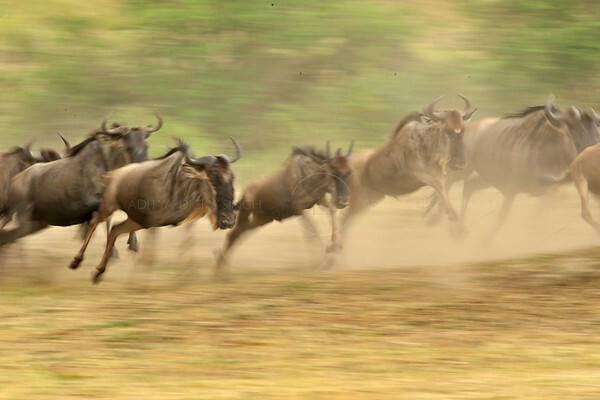 Wildebeests often do this. They will gather in the plains close to the river, walk up to the river to drink, stare across the river and then walk back. Its great to see such a massive gathering of big ungulates that run around and lot and give you zillions of photo opportunities. I had three highlights in the week. 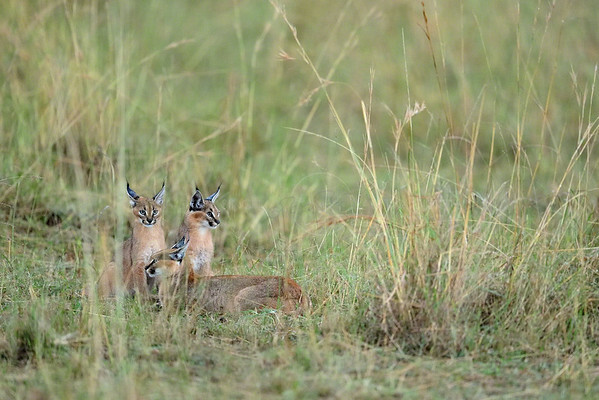 The first one was finding a family of three caracals. 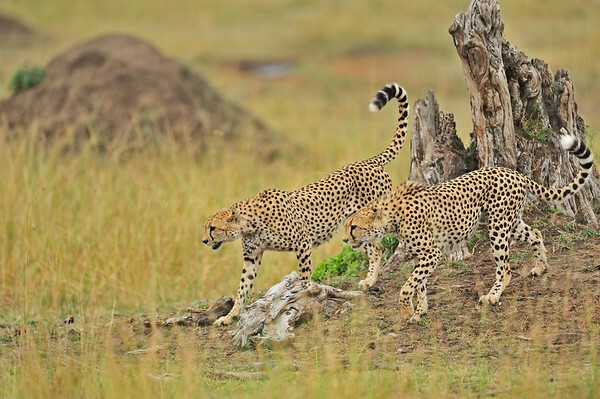 This sighting was courtesy Federico Veronesi – a great photographer and fun guy who has spent a lot of time in the Mara. 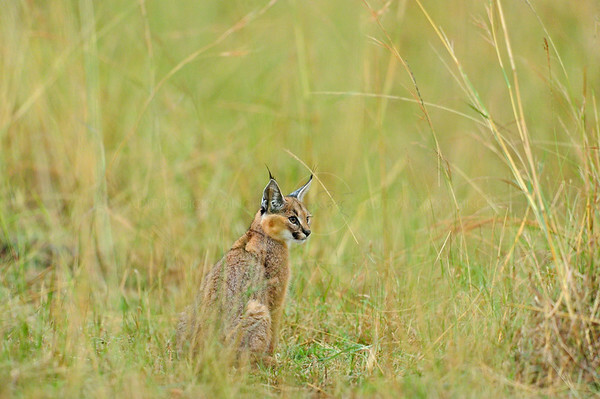 He has been following this caracal (the mother) for a few years and finds her more often than anyone else. He called us when he found the caracals. We reached the spot very close to the camp late in the evening when the light was very low and it was drizzling (the first “over saturated” picture below). The rain stopped when it was time to head back to the camp but by then the light was really low (the second picture below). 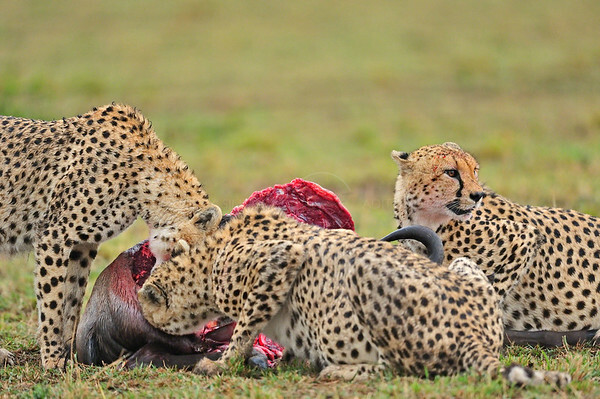 The second highlight were the frequent sightings of “three brothers” or Honey’s boys – three adult male cheetahs that live and hunt together. They did not disappoint us and we saw them make two kills in three days. 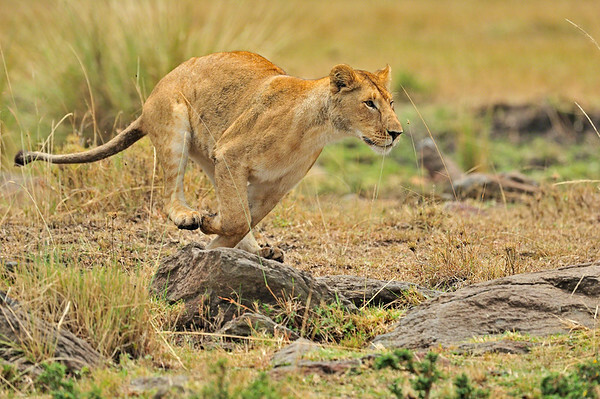 A few weeks later, we heard that a lioness had killed one of these three brothers. The third highlight of the week was being back in the Mara Bush Camp, being driven by Ken Naikuni (the best safari driver/guide for photographers) and driving in one of Sunworld Safari’s vehicle. If I could afford it I would happily spend the rest of my life doing this. This week, like every week in Mara, went by like a blur. Soon it was time to leave the camp and head back to our rough camp in the Mara Triangle. We found a great Bataleur Eagle on our way back to the triangle. Great pictures but I wonder why you have such huge watermarks bang in the middle of the picture. They make every picture look awful. Unsolicited advice I know, but I think the fact that you’ve put up low res images gives enough security that you can retain commercial rights for your photos if need be. That apart, the way I look at it is that if anyone does use your photos they’re paying you an indirect compliment. You could just license your photos under creative commons like Kalyan Varma does. Anyways, that’s my two pence – hope you aren’t offended. Thanks for sharing your experience all the same. These are full resolution pictures posted on my picture site though I embed only a small file in the blogs. One does not need to license any photo under creative commons. The law is that you are a copyright holder the moment you take the picture. You could use the creative commons license to give away some rights but if you want to retain all the rights then you have to do nothing. “The way I look at it is that if anyone does use your photos they’re paying you an indirect compliment” would not be really true. If that was the case then there would be no copyrights at all. 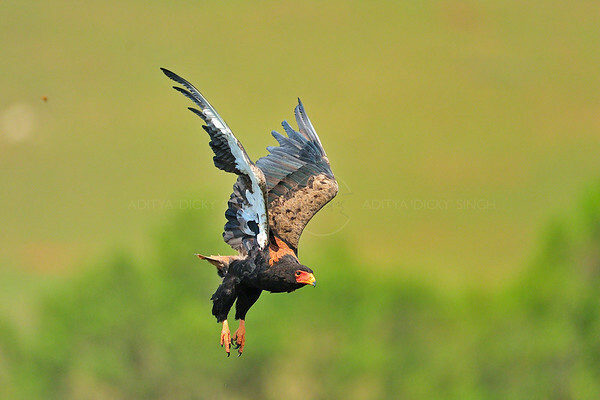 Too many of my pictures have been misused commercially and it is very tough in India to go after copyright violations. So what I do now is to digitally mark every picture visibly and with a covert “digimarc” (which is not visible) that pings back to me. Low res does not help much as you can pick up a 100KB image and use it for almost everything except printing. If I run an image search on Ranthambhore or wild tiger then I find over 50 to 100 pictures of mine in different sites, where they copyright is claimed by the site owner. Most of these are commercial sites. It may not look nice but unfortunately I have no choice but to make them totally unusable.